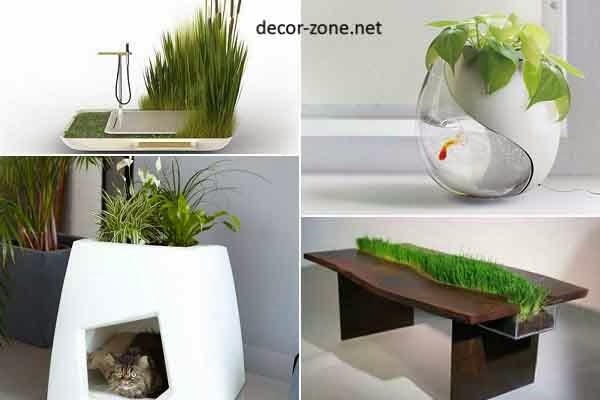 in this post we combined to you the most creative indoor flower pots designs that have additional functions in the apartment. Nowadays, the "living area" differs extended functionality - shower in the reeds, fresh parsley and basil from the school board, blooming trainer, cat house with grassy roof ... 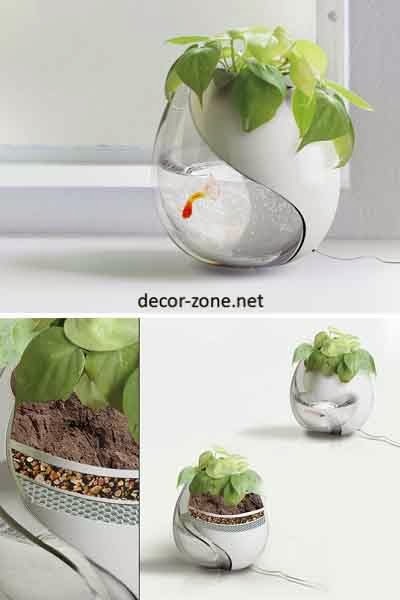 In this survey we collected a dozen designer indoor flower pots designs that are integrated into everyday objects. Table from Vetshteyn Emily ( Emily Wettstein ) have the liking of four-legged family members. In the center of the table there is a long caved flower pot conceived as a home version of feline meadow. In those moments when the presence of plates with inappropriate size you can be easily pulled out. The founders of the French art offices Pousse Créative Hoke Sebastian ( Sebastian Haquet ) and Lanta Thomas ( Thomas Lanthier ) create things, intended to strengthen the relationship between man and nature. 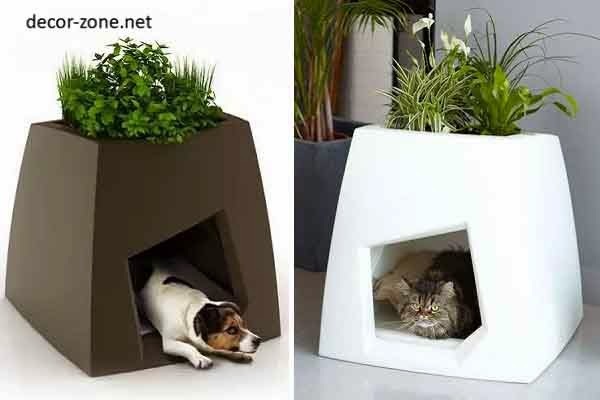 For example, unusual houses for pets , combined with indoor flower pots. Booth Niche Kokon designed for cats and small breeds. 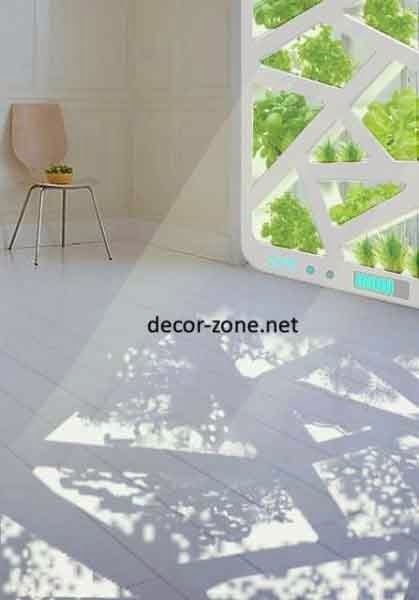 this practical design is suitable for apartments and small suburban farms. Spanish designer Martin Azua ( Martin Azua ) went further . 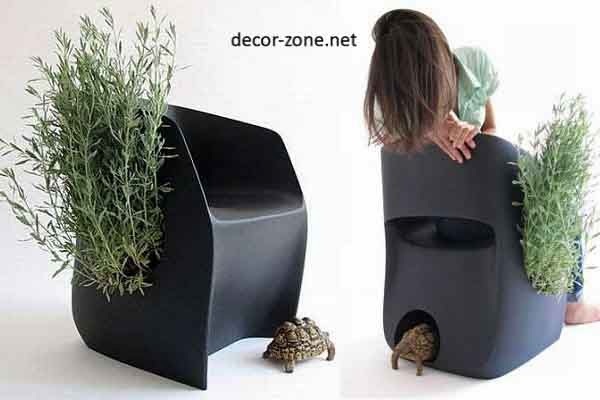 he designed an Inner Life Chair performs three functions - seat for a person flower pots and house for small pets. Chao Chen ( Chen Chao ), Ki Won ( Wang Qi ), Wu Qian ( Jiang Wu ) and Chanksin Ka ( Jianxing Cai ) with combined efforts have developed a concept "window-backyard" . According to the creators, glazed garden Plant Window is good, at least for three reasons. First, the city dweller gets its piece of nature, and a portion of fresh air. Secondly, the closed arrangement of plants protects them from the curiosity of young children and attacks by pets. Shen Tse-Clock ( Sheng-Zhe Feng ) and Lin Cho-Yang ( Ling-Yuan Chou ) invented a symbiotic hybrid indoor flower pot and a mini-aquarium. Irrigation water is filtered and flows into the fish house, and the waste products of the last fertilize the plant. 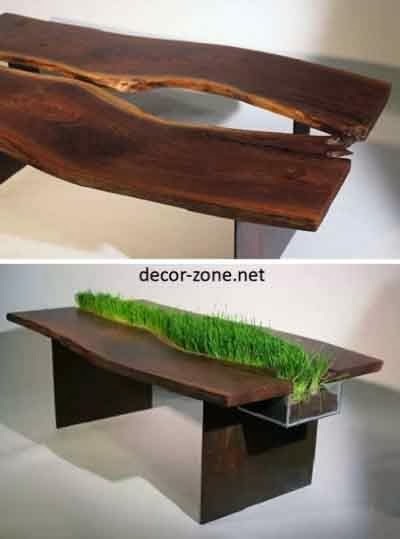 Do not take up much space, "commonwealth" of flora and fauna - great for nature corner at home and office.